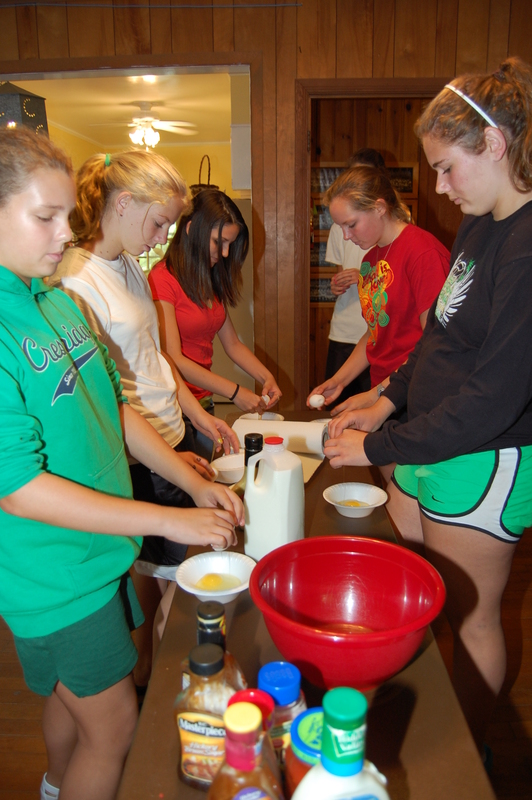 Here’s one final recipe from the Crestridge kitchen for this summer…Pigs in a blanket! 2. Cut each triangle into 4 smaller triangles. 4. Cook about 12 minutes, depending on desired browness. That’s all of the recipes for this summer. 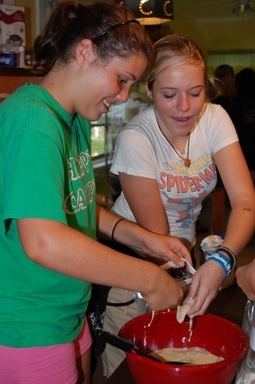 The cooking skill was a favorite and will definitely be back on the agenda next summer. With it will come new recipes for all you campers and camp friends to enjoy!! Ever had mustard, relish, chocolate syrup, ranch dressing, flour and ketchup poured on you? 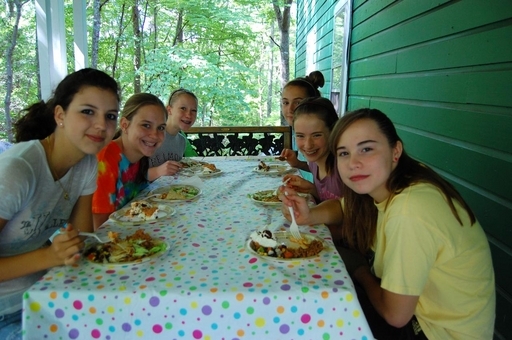 Well, the chippewa campers and staff sure have…and that’s not even all the ingredients used!! When we say messy, we mean MESSY!!! The starter camp girls get to experience lots of the same things that would happen during a regular session. One of those things is the mudpit! The Chickasaws went over to boys this week to play in the mud and had a blast! In the “real” world, people pay lots of money for a mudbath, but I wager they don’t have near as much fun as our girls do! Watch the video and see for yourself. Starter camp has begun and the summer fun continues for another week. Since starter camp is only half as long as a regular session, the campers don’t experience everything. But we try to give them as much of the full camp experience as possible. They participate in skills (albeit a bit differently), village activities and campwide activities. The campwides include campfire, sockwar, and this year…the newspaper party!! Watch the video below to hear about it from Sharon and to see a bit of it for yourself! 1. Microwave cheese in a bowl (sprayed with Pam) on medium until soft. 2. Stir after 2 minutes . Place bowl back in microwave for 2 more minutes. 3. 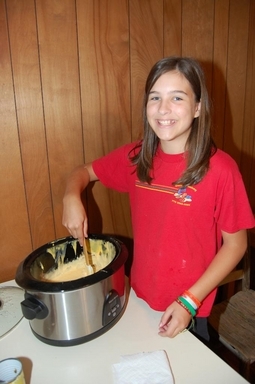 Spray a crockpot with Pam and heat Rotel on high for 30 minutes. Reduce heat and add microwaved cheese. Stir. Chili maybe be added if desired. Another recipe to come in the next few days. This summer we introduced a new camp wide activity…OMC or Organized Mass Chaos. Campers who came session 1B and 2B got to experience what that meant here at camp. As you saw in the video above, it really was chaos. But, as in everything here at camp, there was a method to our madness…no, really. The night definitely was chaotic, but it sure was fun. Tell us your favorite part of the night! Want another addition for that Crestridge recipe book I’m sure you’ve started by now?! On today’s agenda is Vegetable Salsa (serving for 6). Combine all ingredients in bowl. Chill overnight. Yes, it really is that easy and it tastes amazing!! More recipes to follow in the upcoming days! Another dish the girls learned this summer in the cooking skill was fried chicken (serving for 6). Below is the recipe we used here at camp. 1. Dip chicken in batter. 2. Place flour in a ziploc bag then drop chicken into bag and shake. 3. Heat cooking oil to 375 degrees in an electric skillet. 4. 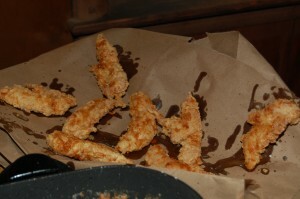 Fry chicken to a golden brown (turn chicken more than once to cook thoroughly). 5. Drain on a brown paper sack or paper towels. 6. Wow your friends with your amazing culinary talent!! It’s the first Wednesday of the session and that means trip day here at Crestridge! Two of the villages, Chickasaws and Choctaws, will stay here in camp while the other three head out the gates. Watch the video below to hear from Sharon as she tells us where the villages are going. 6. Bake 20 min. on 350 degree oven.